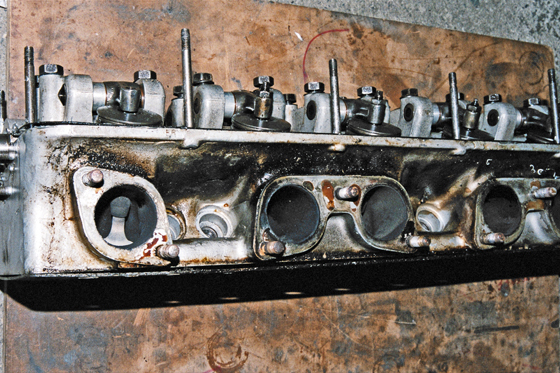 This Forza Head Case 1964 Ferrari 330 GT cylinder head photo shows valve seat inserts needing replacement. 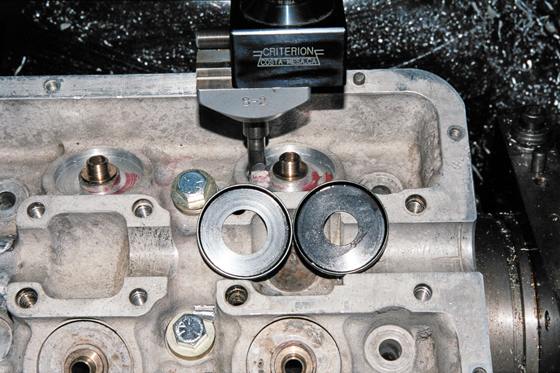 Arrows point to chamber cut by top angle cutter in an on going effort to maintain proper valve seat dimensions. 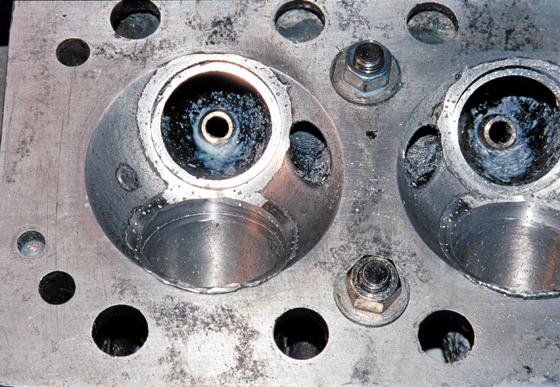 This photo shows the Ferrari 330 valve train problem. 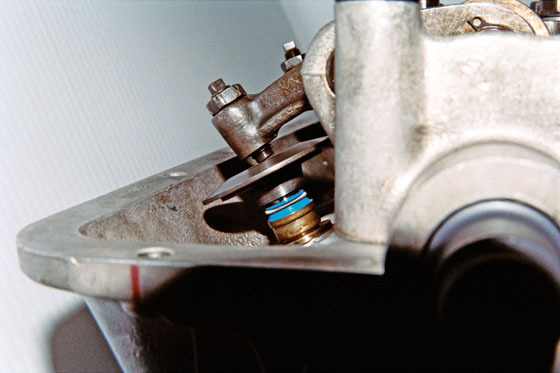 Note the position of the valve adjuster and the rocker arm. 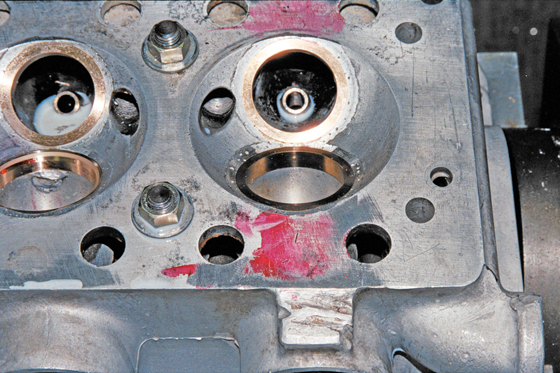 The valve is too high – the adjuster has been backed off too much to set proper valve lash -some retainers are hitting the rocker arm-not readily apparent are the worn out valve keepers. Arrow shows crack between seats. This crack was about 1/16 of an inch from water. Crack from ex. Seat to spark plug is meaningless.Tops of the seat registers have been welded. The crack is vee ed out ready for welding. 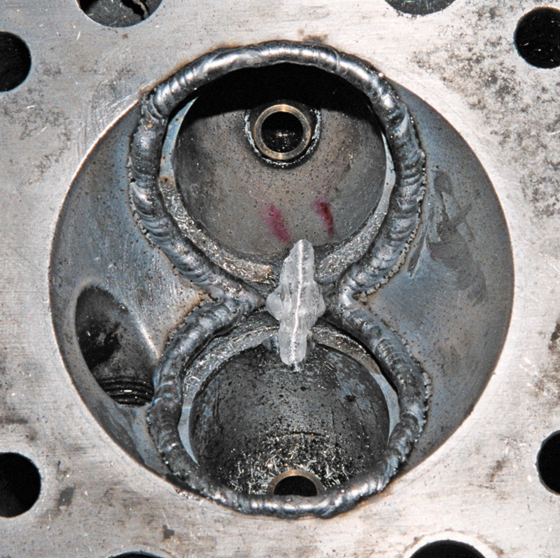 Crack is welded weld deposits will be work hardened – head will be straightened. New made to order aluminum bronze alloy guides are installed, reamed and honed to fit the new made to order stainless steel valves. New seat registers have been cut and the chambers have been rough machined. 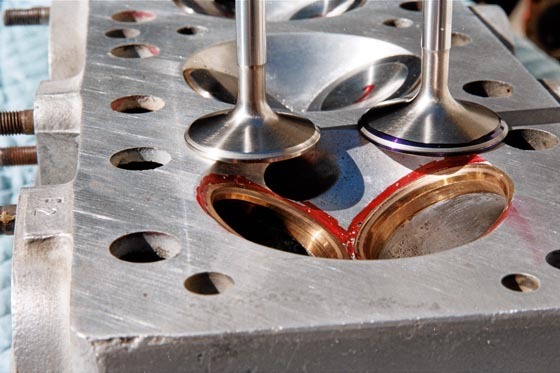 All guides and Bronze alloy seat inserts are shrunk in liquid nitrogen and will fall in with a light tap to a cylinder head preheated to 250 f.
A very light (.003- .005 inch) clean up pass on .the deck surface must be done before the intake valve seats are cut. We ONLY, LIGHTLY, lap valves for photo purposes the near seat is exhaust- you can see the 45 (valve contact area) is at the top of the seat insert- right at the edge of the chamber – note a bottom cut under the 45 Note the edge of the intake seat ( the 45) is at the edge of the deck (see tech comments) Note the bottom cut on the intake seat. 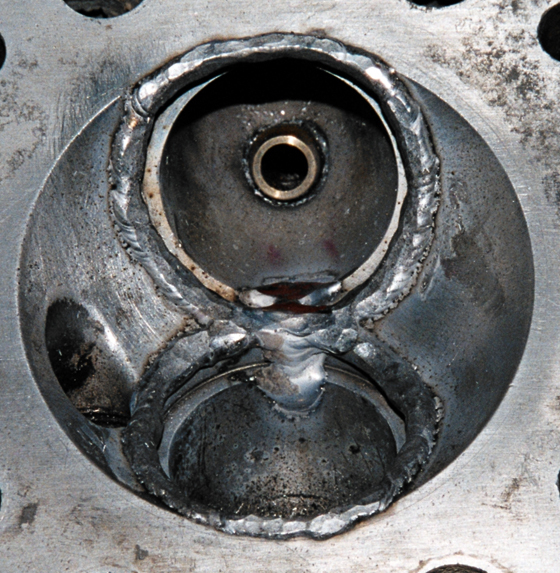 See the valve margins? 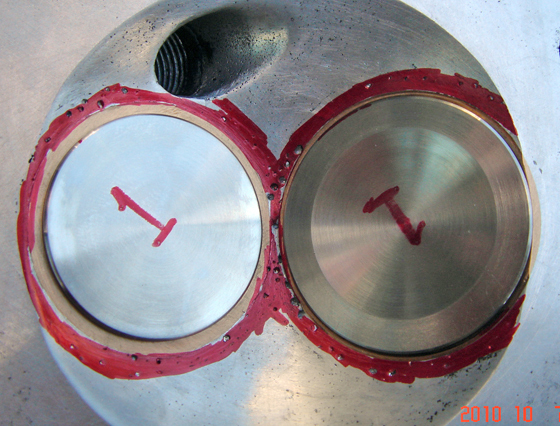 they are in the combustion chamber- not recessed in the seat inserts. 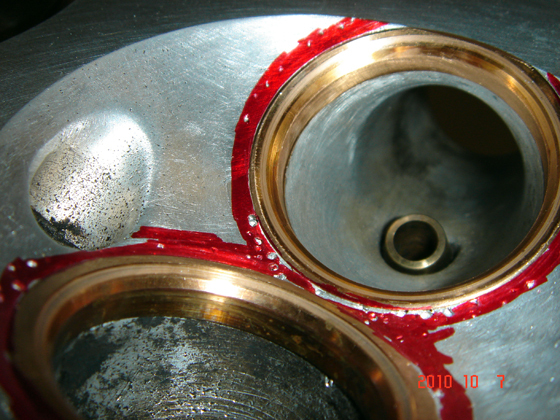 A better view shows the intake valve (right) is at the edge of the deck. Valve job complete. 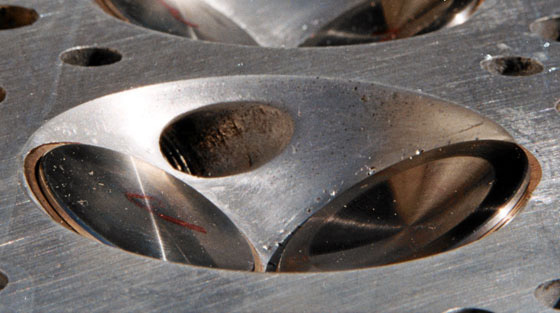 Again for display and photo purposes ONLY- we only lap valves lightly with 1000 grit compound to clearly define contact areas for photos. The blue and red dykem is used to help contrast the areas in question. 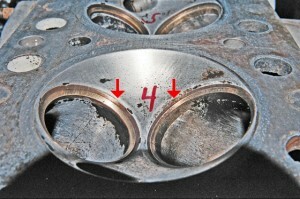 The 49 year old spring seat cups were cracked and distorted. Stock B.B. Chevy spring seat cups almost fit. We bored the spring seat registers slightly and bored the cup I.D. slightly to provide an economical replacement. One of many trial assemblies. Here we are checking spring retainer to valve seal clearance Our new guides were ordered with modern valve seals in mind. Final assembly. 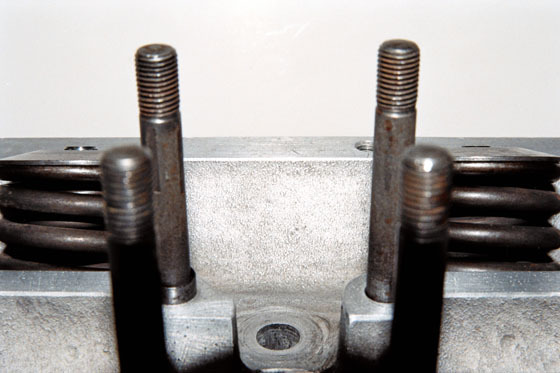 Note the difference in valve stem heights above the spring retainers. Our trial assemblies missed the worn out valve keepers. 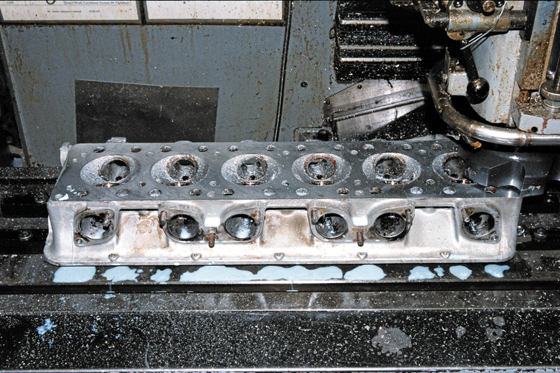 We had to strip the heads, shorten the top of the valve guides, and clean the heads again. This problem was also evident in the previous photo. Did you notice it? Our 308 flow bench fixture needed little modification to accept the completely refurbished 1964 Ferrari 330 G.T. 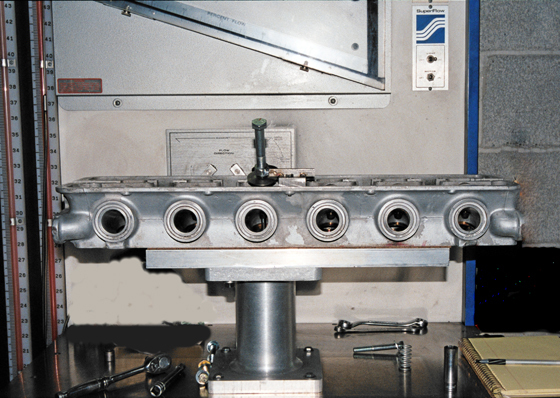 cylinder head.